Hello and welcome to my website. 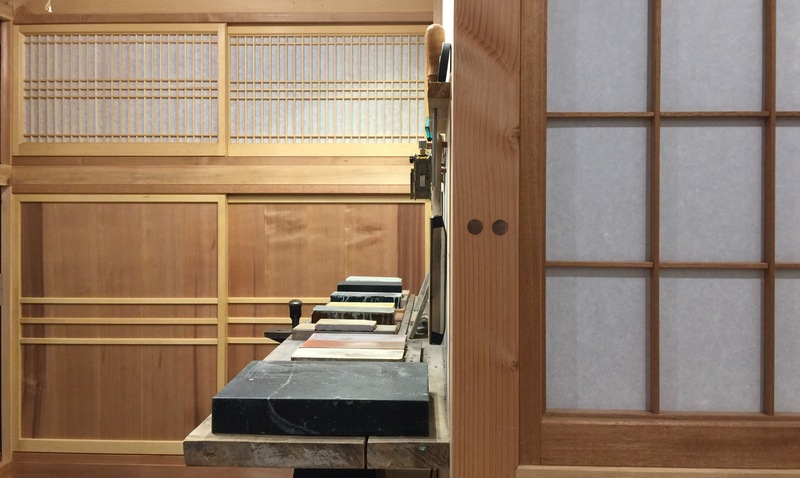 This post will exist to provide information in order to provide a basic understanding of Japanese sharpening stones (whetstones), and provide a list of sources for procuring those items. I will provide links in some cases, I do earn from those links and if you decide to purchase through them please consider it a wonderful contribution to this site. Japanese whetstones can be broken up into two major categories; synthetic stones (man made) and natural stones. I have a detailed post on Natural stones, so this post will focus mainly on synthetic stones. Japanese synthetic stones form the basis of my sharpening system, they are used for everything from basic removal of material all the way on through the majority of polishing. The final polish being reserved for Japanese natural stones in most cases. I cover the detailed process that is sharpening in my classes, in this post I will cover the basic setup needed, in my experience, to begin sharpening effectively. This is my sharpening setup, I like working at approximately a counter height for my dimensions it provides me a comfortable work station. I’ve added excellent lighting to ensure that I can see burrs, damages and defects in my sharpening and of course see when those defects are removed. On the left side of this station I have an anvil, it used for general purpose around the shop and for ura-dashi with a fixture. The large plate on the right is a granite surface plate and it is used for general checking of things, very handy item to have. My process begins with a rough stone, I prefer to start at 800 grit and use it to remove wear from my edged tools. The stone on the right is a Chosera 800 grit. Next, I sometimes use a Chosera 1000 grit, (green stone on the right) but most often I skip that stone. In spite of the fact that this stone is considerably thinner than when I received it. For a very long while this was my rough stone, but the Chosera 800 is much faster. Once the rough work is complete my next step is to a Chosera 3000 grit stone. At this point, I’m the next steps are determined entirely by the level of detail needed in the work at hand. Normally I move onto Japanese natural stones, however occasionally if the work calls for it I will next move to a fine synthetic such as this 8000 grit Naniwa Snow white for reasons unknown it began to crackle when I used it, however it has not affected the performance to my knowledge and I’ve used this stone for at least six years now. I also have a Sigma 13000 Grit, this is another tool in the arsenal, which can be deployed in situations which call for it. I’ve actually used this as a finish stone for NYZ kez and pulled a very fine shaving with the resulting edge. It’s an excellent stone. I believe So at Japan-tool can order them. This lineup provides my basic kit and has served me well for a number of years now, sometimes sharpening individual blades ten or more times in a single day’s work. These stones will sharpen simple steels and complex steels all the same, so I have used them for white 1, K120, White 2, Blue 2, Blue 1, Super Blue, Super White, and in a very limited capacity Powdered metal steels and high speed steels. I have also used them on my western blades such as those antique steels in my Try and Jack planes, A2 steel, 01 steel and likely a few steels I’m long forgetting.